TEMCo offers wide selection of welding cables. Choose from variety of cable lengths, colors and gauge sizes. Our welding cable size chart is available to help you choose the right wire for your applications. The welding cable size chart below includes the wire gauge, length of the wire, diameter, weight, technical details and color of available. The important specs to go by when choosing the appropriate wire that is suitable for your applications are the wire gauge, amp, voltage rating and the length needed. If you have the specifications readily available, you can simply choose the appropriate wire with your specs from the welding cable size chart. If one or more of the criteria is not defined on the welding cable size chart, it would be safe to go with a wire that correspond to the larger size from your required specs. Choose from TEMCo line of 600V welding cable. Fully annealed stranded bare copper per ASTM B-172. Power supply applications not exceeding 600 volts A.C.
Why should I buy my welding cable from TEMCo? We have a wide selection of high grade EPDM jacketed welding cables. Our cables are manufactured here in US, and are resistant to cuts, tears and abrasion. Who manufactures the welding cable sold by TEMCo? AWC - Allied Wire & Cable is a distributor of electrical wire, cable, tubing, and more. How can I order welding cable from TEMCo? Do you offer welding cable in any other color than black? 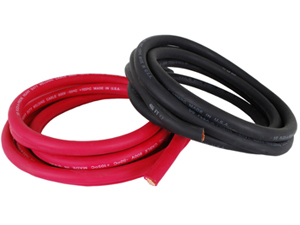 We currently offer only red or black welding cable. Do you offer sets of welding leads in red/black combination? Yes, you can view our red/black combination listings here. How fast will I get my welding cable ordered from TEMCo? How soon is my order of welding cable shipped from TEMCo? Ships from stock same day as order. Most orders ship with Expedited Mail, 1 to 3 day transit time. Please note the following increments and larger of welding cable will go via standard shipping (1 to 7 days). Should I use a different size lead for the positive side than the negative side? Lead size (gauge) really only affects the amount of current the wire can safely carry before damaging the insulation. It is best to make things easy and use the same size lead for both positive and negative sides. If you need to use different sizes for some reason then make sure both sizes of wire have a high enough amp rating. Since the secondary circuit in an arc-welding is set up in a series circuit the smaller lead will get hotter. What if I want a short ground lead and a long positive lead? How do I order a set of welding leads this way? Can you pre terminate my welding leads for me? Pre-termination is available on request for quantity orders. What if I want a larger length of welding cable than you have listed? Do you stock more than what is listed? We can provide longer cable, but we do not stock lengths other than what we have listed so it will take longer to ship out. Will TEMCo offer cut-to-length welding cable? We only offer custom length cables for quantity orders. Please call us for a quote if you need a cable cut to a specific length for a quantity order.